Golden Calf Company is proud to announce a new colostrum thaw and pasteurizing unit: Calf Hero™ 6. With the capacity to process six meals of colostrum at once, it is designed for growing dairies. This unit is the latest addition to the very successful Calf Hero™ colostrum management line, which offers state of the art technology. Built in Wisconsin of heavy duty stainless steel, it is designed with durability in mind. Exceptional user experience is guaranteed with a large 6” touch screen, oversized icons, instructions in multiple languages and an audio and visual alarm. The Calf Hero™ offers text messaging, emailing, and remote troubleshooting. SMART technology makes maintenance easy and ensures minimal downtime. 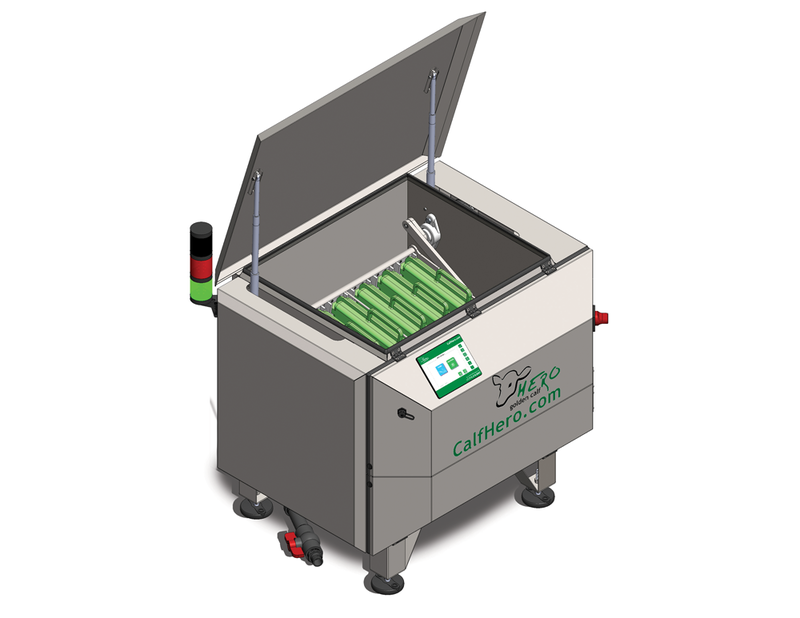 The Calf Hero™ 6 even includes a cleaning cycle and a supplies ordering module. The Calf Hero™ 6 is part of a colostrum management system that includes a full suite of accessories including colostrum testing, storage bags, freezer, and feeding tools. This colostrum management system clearly defines everyone’s responsibilities, is easy to implement, and provides fool-proof steps to assure everyday repeatability by multiple employees. The system thus enables the maternity workers to treat each calf as if it is the only calf that day. In full-filling Golden Calf Company’s mission “to provide dairy producers with innovative products for calf care”, our goal is to supply dairy farms the right tools to achieve a consistently healthy calf population. Based in Bloomer, WI, Golden Calf Company has been an innovator in the dairy colostrum feeding field since 2010.